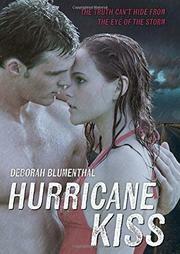 Two teens find themselves alone as a Category 5 hurricane threatens Houston. Jillian lives next door to River, her school’s former football star gone bad. The two white teens flee the hurricane with River’s father, but they’re quickly stuck in gridlock, with all the other evacuees. With the storm looming, River and Jillian feel they are sitting ducks, so they leave his stubborn dad with the car and run back to Houston to shelter in their empty, sturdy high school. Once they break in, the two flash back on incidents that reveal their back stories. As the book alternates between the viewpoints of Jillian and River, readers slowly learn why River was sent to juvenile detention and how his authoritarian and abusive football coach inflicted such damage. However, he saves Jillian’s life during the storm and finally tells her his story. Blumenthal uses the chaos and violence of the storm as an effective backdrop for River’s story, and the aftermath of the storm, with its massive cleanup, reflects the beginnings of his recovery. Readers expecting a romance between Jillian and River will finally be satisfied, but the focus remains on the character development of the two teens. Exciting descriptions of the savage storm sustain the suspense nicely.